I hate packing shoes. No matter how we try they always end up weighing us down. You need shoes for walking, ones that can get wet, ones that are good in heat or sand, and ones that are easy to slip on and off. It always seems that I'm left wishing I had brought more options. Whether we're trying to get 4 people's worth of stuff into carry on luggage or loading up our teeny tiny trailer for a camping trip, shoes are ALWAYS the biggest space wasters. Pikkpack has a solution for that and I was defiantly willing to try it out! Their leather shoes have the ability to be packed flat and are constructed by the user when they're needed. A very cool concept. I took our sample pair of Pikkpack shoes camping with us to Blue Lake, Ontario last weekend. I chose brown leather with green lacing which was a fun bright accent. Did I ever mention that green is my favourite colour? Each pair also comes with a grey alternative lacing so you can switch it up if the mood strikes. I have to tell you, I love a good camp craft. There are few things more relaxing than sitting by a bonfire and chilling out with an easy project. The lacing of both shoes took me about half an hour in total. It was easy and kind of exciting to see the finished product. Also, I could have a glass of wine while doing it! As far as comfort goes, I think these would be great shoes for around camp or on the beach. They're easy to slide on and off, and since they're leather, they will soften up and form to your foot the longer you use them. As far a packability goes, the flat deconstructed design is very innovative. Even in their constructed form Pikkpack shoes are light weight and come in a cotton shoe bag that can be thrown into your pack without much fuss. Check out their website for both natural leather and bright rubber sole options. You can mix and match your own colour combination. 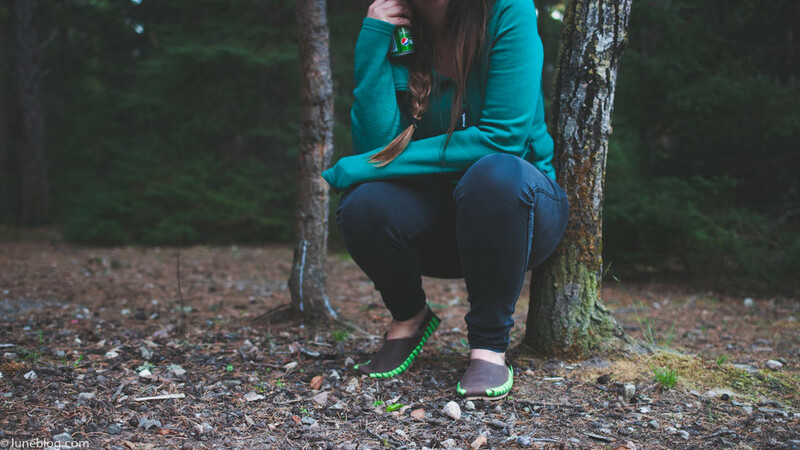 A big thank you to Pikkpack Shoes for sharing their fun product with us at Lune Blog, so we can introduce them to you!